Yesterday, Day 3 of Event: 41: $3,000 No-Limit Hold'em came and went as the final 30 players of a 1,394 field was reduced down to just two—Greg Ostrander and Jackie Glazier. Those two returned on Monday for an impromptu Day 4 with Glazier holding a 9,480,000 to 3,070,000 chip lead over Ostrander. The high blinds ensured the action was fast-paced, and an hour's worth of play ended up being a wild ride. Glazier whittled down Ostrander a bit before the latter doubled, and then the same scenario repeated itself a short time later. After receiving his second double, Ostrander managed to move into the chip lead and never looked back. In the final hand, Ostrander raised to 200,000 on the button and Glazier called from the big blind. Both players checked the flop, and the Glazier check-called a bet of 450,000 on the turn. When the peeled off on the river, Glazier checked, Ostrander slid out 1 million, and Glazier moved all in. Ostrander hesitated for a moment, and then made the call with for a ten-high straight. Glazier showed for two pair and it was all over. 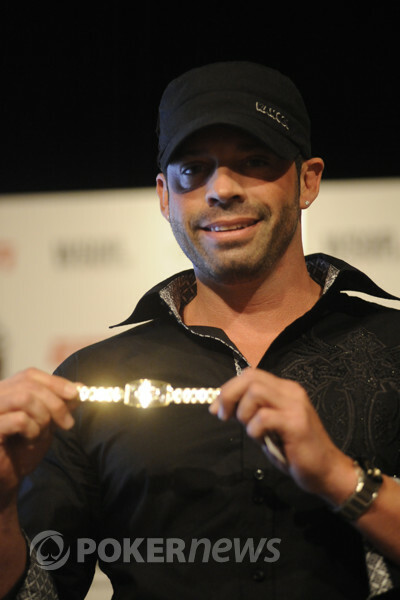 Ostrander managed to win his first gold bracelet, not to mention the $742,072 first-place prize, while denying Australia’s Glazier from becoming the first woman to win an open World Series of Poker Event since Vanessa Selbst took down a $1,500 Pot Limit Omaha event back in 2008. That does it for our coverage from Event: 41: $3,000 No-Limit Hold'em. Be sure to check out our Live Reporting section to find out what other events are happening now. Greg Ostrander raised to 200,000 on the button and Jackie Glazier called from the big blind. Both players checked the flop, and then Glazier check-called a bet of 450,000 on the turn. When the peeled off on the river, Glazier checked, Ostrander slid out 1 million, and Glazier moved all in. Ostrander hesitated for a moment, and then made the call with for a ten-high straight. Glazier showed for two pair and it was all over. After Jackie Glazier raised to 250,000 and Greg Ostrander called, the flop came down and both players checked. When the dealer burned and turned the , Ostrander check-called a bet of 375,000. The river saw Ostrander check for a third time, opening the door for Glazier to bet 550,000. Ostrander made the call and Glazier immediately sent her cards to the muck. Greg Ostrander raised to 275,000 on the button and received a call from Jackie Glazier, who turned around and led out for 350,000 on the flop. Ostrander responded with a raise to 850,000, and it was enough to get the job done as Glazier quickly folded her hand. Greg Ostrander opened for 200,000 on the button and Jackie Glazier defended the big. 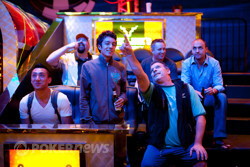 Both players checked the flop, as well as the turn, before Glazier check-called a bet of 325,000 on the river. Ostrander tabled and was playing the board, while Glazier showed for aces up and the win. 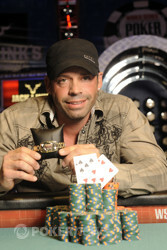 Greg Ostrander raised to 275,000 from the button and Jackie Glazer defended from the big. The Australian proceeded to check-call a bet of 475,000 on the flop before check-folding to a bet of 1 million on the turn. With that, Ostrander has taken the chip lead. After Jackie Glazier opened for 250,000, Greg Ostrander three-bet to 700,000. Glazier responded by moving all in and Ostrander called off. Ostrander was ahead and was looking to dodge high cards, specifically paint, which is exactly what he did as the board ran out an uneventful . Greg Ostrander raised to 250,000 on the button and then called a three-bet of 650,000 from Jackie Glazier. The latter then moved all in on the flop, inspiring Ostrander to fold. 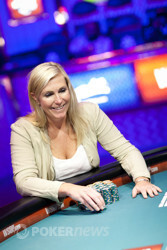 Jackie Glazier raised to 250,000 on the button and was met with a three-bet to 700,000. Glazier responded by moving all in and Ostrander snap-folded. Will Glazier Become the First Woman Since 2008 to Win an Open Event or Will Ostrander Stop Her?